You’ve got the house decorated, why not ask a few friends over for some holiday cheer? Here is a no-fail plan for a quick get-together-just in time for the most wonderful time of the year. The food doesn’t have to be overly complicated. Serve a few make-ahead or store bought appetizers that guests can easily pick up and not have to wrestle with silverware. I’m a big fan of grazing-it enables easy mingling and conversation. A cheese board is very easy and always a favorite. Add one or two holiday treats, a dessert cocktail, homemade truffles, or even a simple assortment of nice chocolates arranged on a tray to complete the menu. Mix a signature cocktail or chill a few bottles of something sparkling: Champagne if your budget allows and Prosecco if it doesn’t. Turn on some holiday tunes and you’re ready to celebrate. 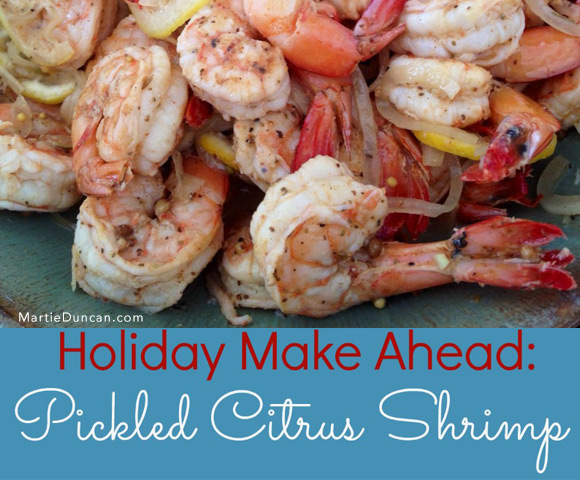 One of my favorite make ahead recipes is my Pickled Citrus Shrimp. I made this recipe for my pilot for Food Network Star because it has always been one of my signature dishes. I discovered this recipe about 20 years ago and have reinvented it many times based on what I had in the house. Around the holidays I add orange slices, a few whole cloves, and a splash of orange liqueur to change it for the season. Prep Time: 15 minutes if you buy peeled and deveined shrimp. If you buy shrimp you have to clean, add 20 minutes. Mix the Old Bay, salt, and pepper together in a small bowl. Place shrimp on a sheet tray, drizzle with 2 tablespoons of the olive oil. Sprinkle with the Old Bay mixture. Cook for 6 minutes or until shrimp just turn pink; flip and cook another 2 minutes. Whisk all of the marinade ingredients together in a large glass or plastic bowl except the lemon and orange slices, and bay leaves. When the shrimp come out of the oven, put them directly into the marinade, toss, add the lemon slices, orange slices, bay leaves, and let cool. Wrap the bowl tightly with 2 layers of plastic wrap. Put the bowl in the refrigerator and marinate, turning the shrimp in the bowl occasionally to mix well for at least 8 hours and for up to 24 hours before serving. Place a large glass bowl in the fridge to chill for serving the shrimp. To serve: Remove the bay leaves. Strain and reserve the liquid from the shrimp using a medium sieve or strainer so the seeds and cloves can pass through but it is ok if some remain in the shrimp. Put the shrimp in a chilled glass bowl. Add some of the marinade, (leave out the seeds) back to the shrimp and toss. The shrimp should not be swimming in the marinade liquid. The onion, lemon, orange, and seeds are all edible but are for garnish and not intended to be eaten so you can omit them from the serving dish if you prefer. Serve in a large bowl with a slotted spoon. Homemade truffles are so delicious and so creamy; they are so worth the effort. These make a nice gift for the holidays or the perfect addition to a dessert bar. In a small saucepan, bring the cream to a simmer. Add the butter and stir until melted. Add the chocolate chips. Stir until completely melted and smooth. Remove from the heat and pour into a shallow bowl or Pyrex baking dish. Use a very small ice cream scoop, a melon baller, or very small spoon to roll the mixture into 1-inch balls. Keep your hands cool by washing them in cold water before you roll the truffles. 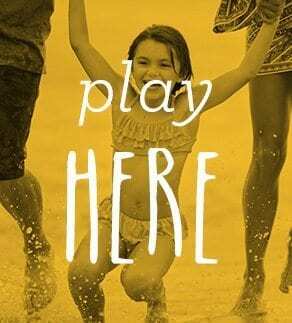 Dust each ball with cocoa. Refrigerate in an airtight container for up to 2 weeks. You may also roll truffles in finely chopped toasted nuts, toasted and chopped coconut, or dust with Confectioner’s sugar. Makes 24-30 depending on the size.